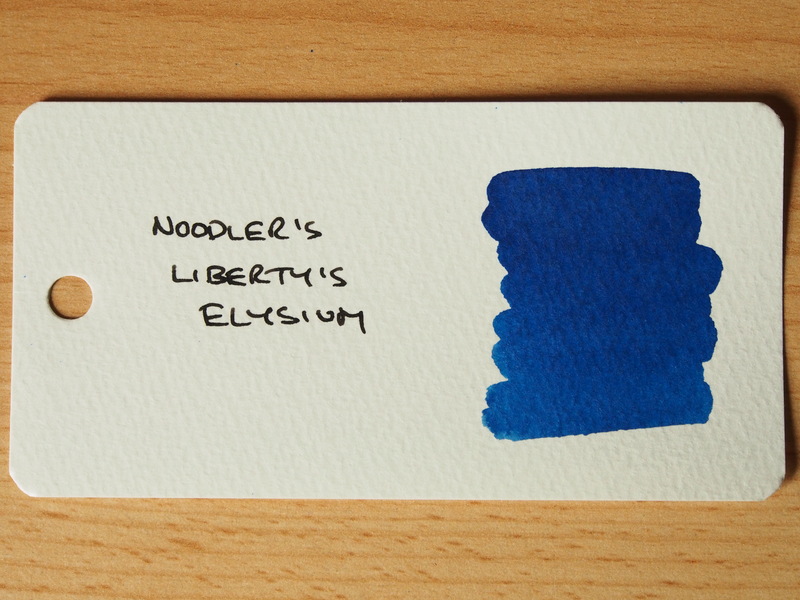 This ink is a Goulet Pen Company exclusive, so there are no prizes for guessing where I bought it from. 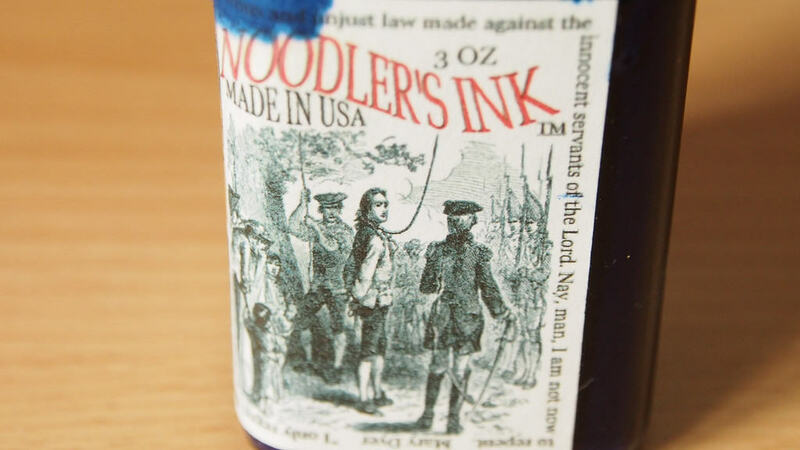 My knowledge of the American War of Independence is no better than most other Britons, so the name of the ink and the images on the label don’t resonate with the in the way they would with Americans, but I must admit that just looking at the label did prompt some Googling, so this is the second time that a Noodler’s ink has helped me understand more about US history. 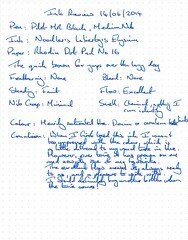 As an aside, I visited Richmond, Virginia a couple of times in the 1990’s and recall passing St John’s Church where Patrick Henry gave his “Give me liberty, or give me death” speech, which features on the label of this ink. I never visited the church, which I now regret. The ink arrived well packed, unfortunately there was a minor leak which obscured some of the attractive label. It also stained the box (usual white with black line art) so I threw it away, which is why it is not included in the main photo. Despite this, the 3oz bottle seemed full to the brim. The order included another item which pushed it just over the limit for customs, and so attracted a charge. I can’t complain about that, and it’s certainly not the fault of the supplier as I knew when I placed the order the risk I was taking. I was less impressed by the courier’s handling charge, which was actually significantly higher than the original customs charge, but again this is not the fault of the supplier and is just something else I have to factor now in when placing overseas orders. 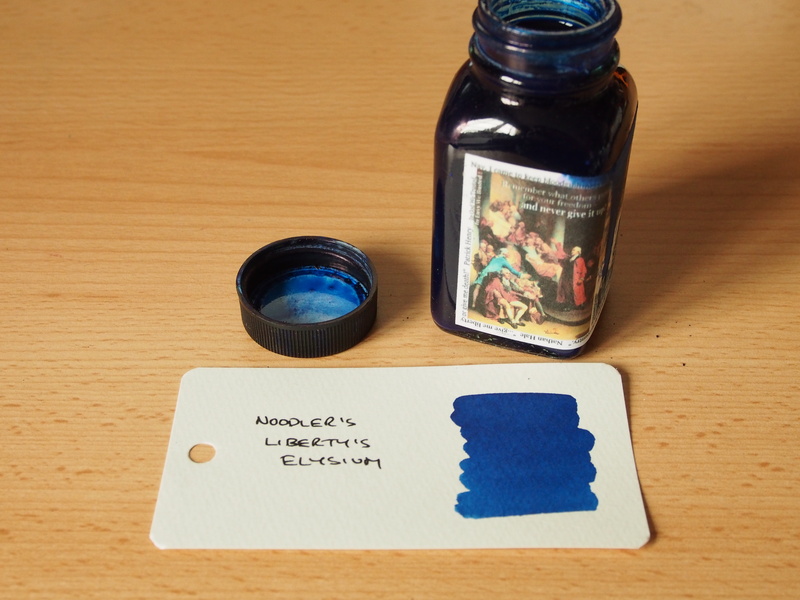 So this ink worked out more expensive than usual, but still less than the typical retail price of (for example) Pilot Iroshizuku inks in the UK. 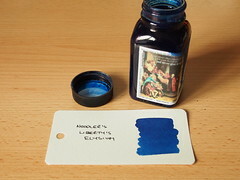 The ink showed what I would describe as moderate water resistance – certainly the drip test moved the ink a little but the lines were still legible. I had no problems cleaning it out of the Pilot MR test pen. I found drying time to be around 20 seconds, which I still consider to be fairly quick. 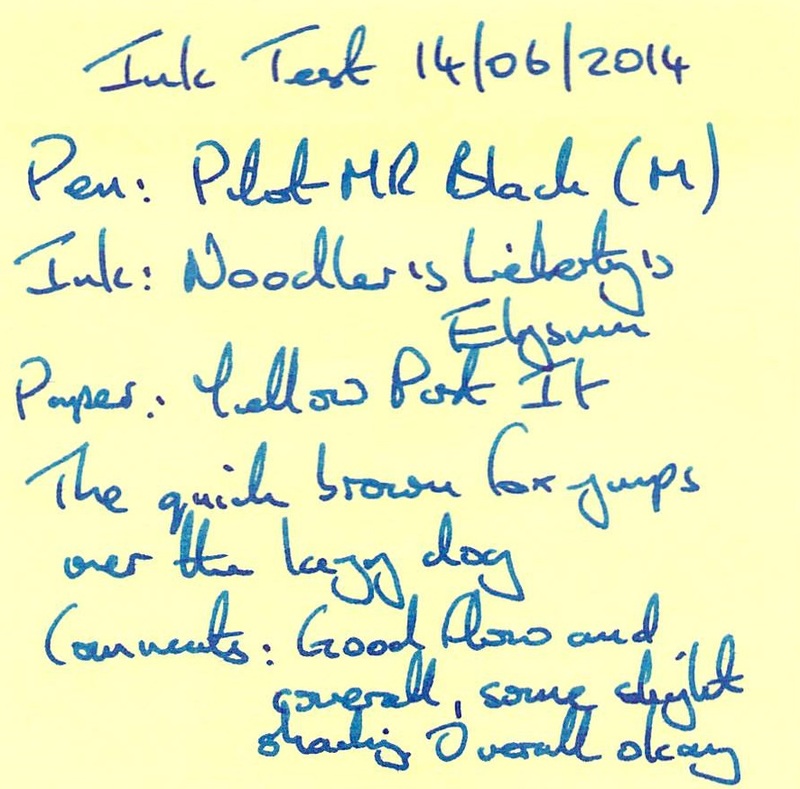 I must admit that when I first tried this ink I was slightly underwhelmed. It wasn’t quite as punchy as some other blues I has tried, and there was a slight hit of maybe denim or cerulean blue that’s often not to my taste. But this shows the importance of not jumping to conclusions and why I like to run tests for more than a week. The colour quickly started to grow on me and the sheer please of the writing experience, especially the good flow, rapidly made it one of my favourite blues. 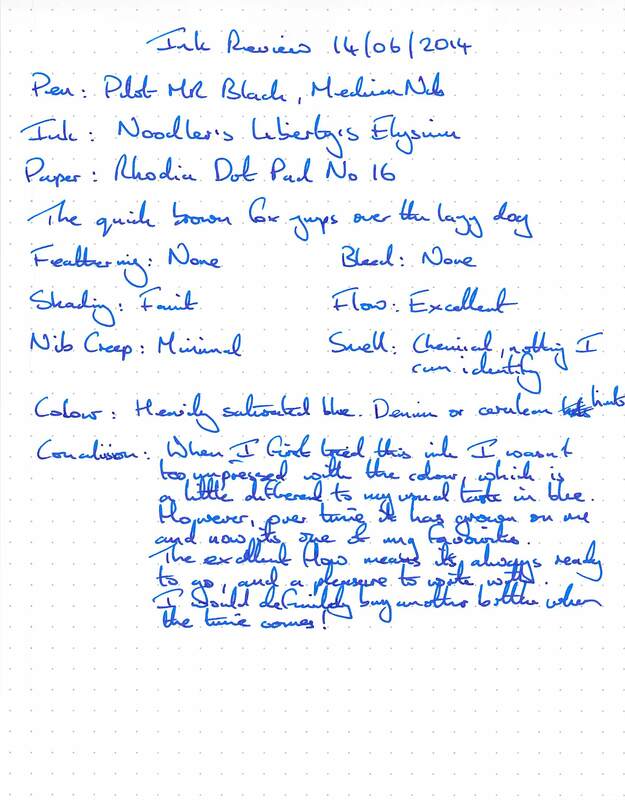 I only wrote in “okay” in the comments – looking a the sample again the coverage looks pretty good to me so I’m not sure why I gave it such a lukewarm assessment. Oh well, no ink is perfect. Lots of feathering and bleed, and the ink looks washed out. Edit: The scan looks much more saturated than the ink did on the paper in reality. This looks slightly more punchy on the off-white paper than in the writing tests. A really good choice for general note taking. 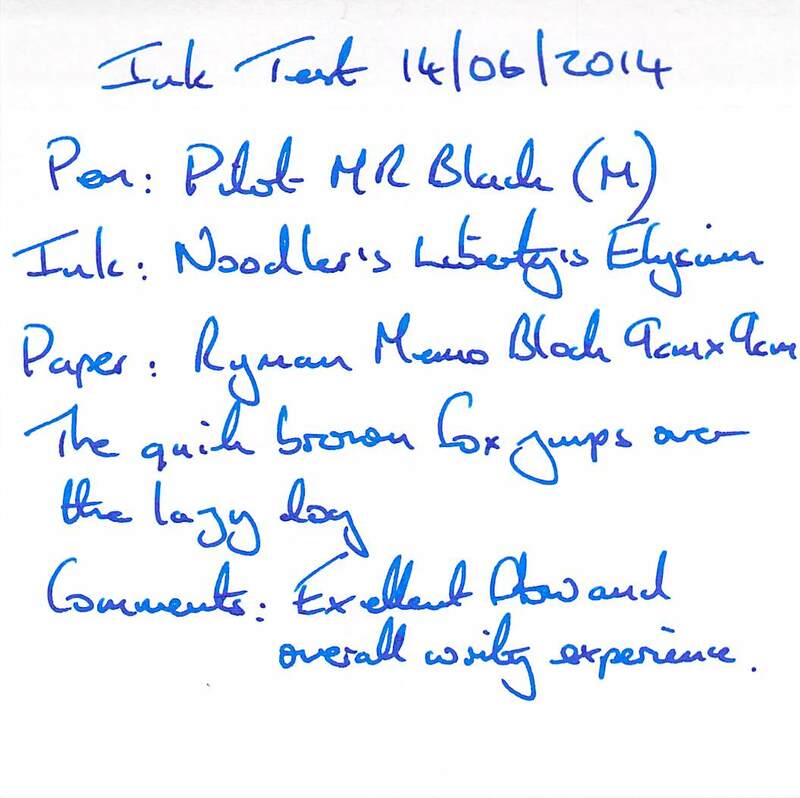 Despite the fact that the ink worked out more expensive than usual, its excellent performance more than makes up for it. I will definitely restock when the time comes – I’ll just try harder to keep it under the custom’s limit next time, or include it as part of a much larger order to make the charges worthwhile. 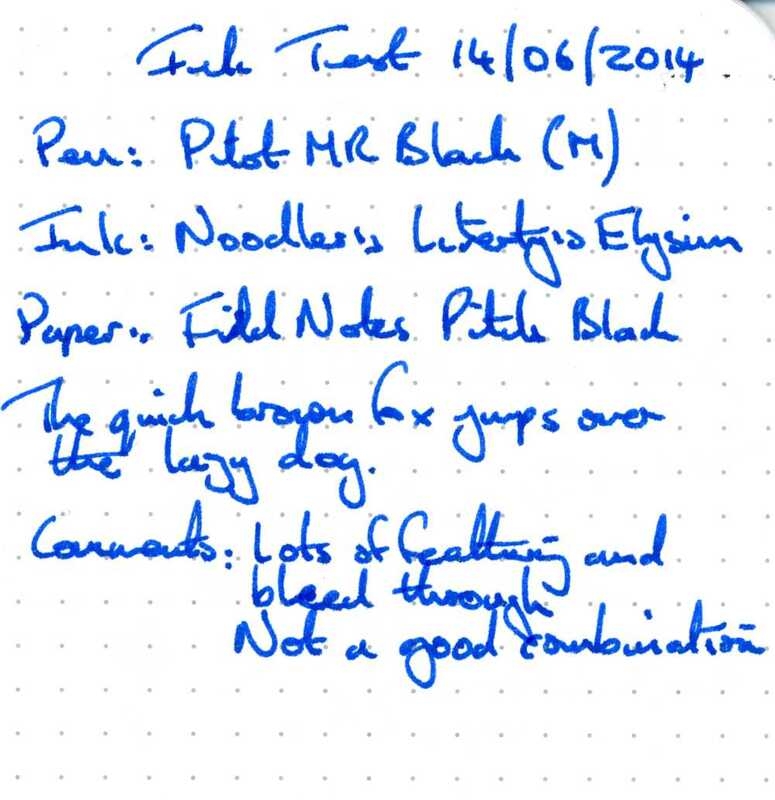 I have start up problems with this ink in my Lamy Safari, I’m testing in a Pilot 78G to see how it behaves.